Well I myself love to heat treat and I was thinnking that maybe I would like to see other peoples hammons and the different designs that people come up with. So I would like to see a picture of evey and anyone who heat treats with clay to show off some of their work. If any one has an issue with it please let me know so we can move the thead or something as I do not want to disrupt any thing. But I love lookingat hammons sorta a side hobby, like those guys that trace or draw japanese swords and their hammons. I will post mine with in the next few days as I need to get a better digital camera. 52100 Quenched is ok ? 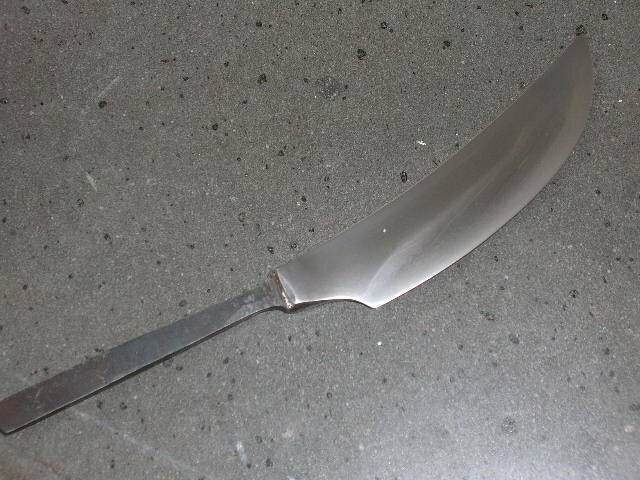 Tanto forged from an old rasp, treated as 1095. 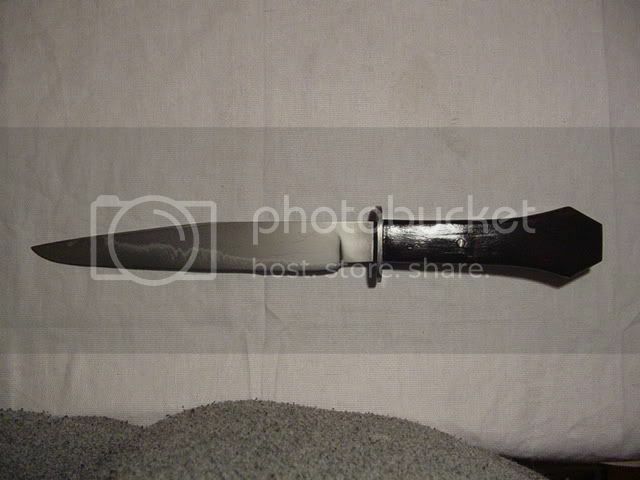 Here's a portion of one from a tanto. I have shown most of mine here but this one. W1 quenched in oil. Here are a couple for you. Photos are difficult to capture the entire hamon. Reflections and dispersion cause lots of problems. Check out articles in the Photography section. I just bought a Nikon N70s, very happy. Also built a black box to try to capture. Scanning on a copier will work also, see my last post. Can everyone please tell us how you are heat treating, hints and how you photo? Satinite, charcoal mix, bring to 1600 (1095), water, then into oven at 350 for 2 hours, cool, back in oven for 300, 2 hours cool. let sit for 24 hours before polishing. If anyone wants I will detail polish that works for me. Satanite straight, thought about adding charcoal to the mix. I heat treat in my gas forge until what I feel is 1500 degrees of higher based off the color of the blade ( I do this at night) as I look for shadows any other issues that might creep up on my during the heat treat. And due to having clay on the spine to form my hammon I do not soak my knives inthe oven to soften the hard steel. I then take the blade to my shop and wire brush it to clean the excess clay off. Then take it to the belt grinder to clean the blade looking for any small cracks or anamolies. 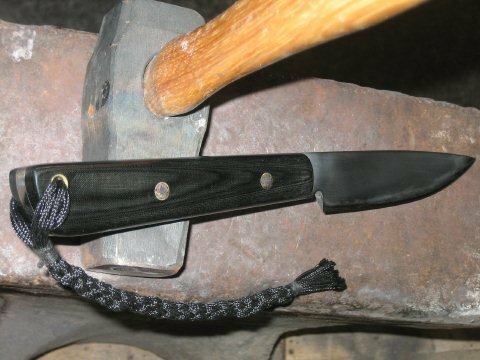 Then I sit down and start my polish detail, i built a nice polish stand for handling a knife up to 14 inches long and it alows me to work the whole blade with out having to adjust the blade I will be posting pictures soon of my setup. Guys I love these hammons, I for one learn alot from looking at them, perhaps we can some day do a who's, who on hammons. Maybe have a hammon contest to see who can come up with the most creative and most beautiful hammons. Who knows? Maybe Don can add his wisdom on this. Because the way I see it we toil away designing and creating beautiful pieces of art and that's it. I say we should have some fun amonst ourselves and have a contest maybe have a prize or two for the winner or winners. Well lets think on it for a while and see what comes of it. 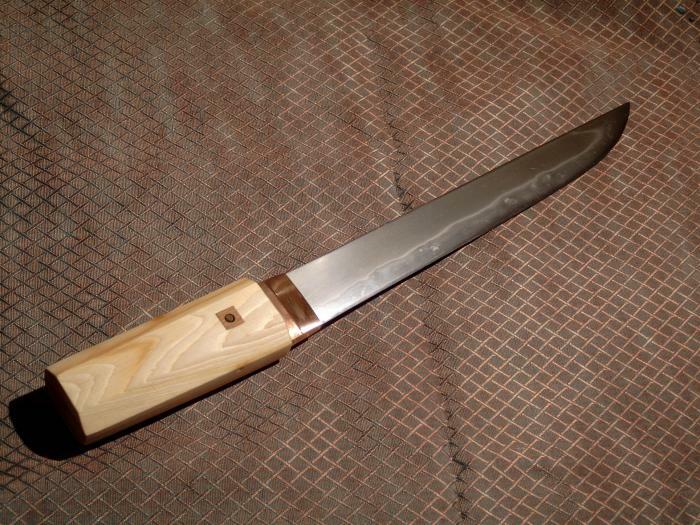 Interests:Bladesmithing in japanese style. Learning stone polishing. I make some western knives. Here's one of my latest. Hope I can do that whenever I want. Did this pattern follow the clay very close? Can you share with us what was done here?? I love em guys, keep em coming. I would also like to start a hammon gallery. Perhaps we will see patterns emerging in regards to hammons and the creators of those hammons. As I truly think the work presented here is truly amazing. This quick tutorial is to outline my quenching technique. It may not be an ideal method, but it works for me and produces satisfying results. This tutorial does not detail the quenching technique but rather focuses on the clay preparation and application. Quenching is another large subject. Not all steels give good quench lines (hamons), I noticed that the less alloyed the steel is, the wider is the temperature range that creates a good visible line. For example with 1.3505 (100 Cr6, 52100) you can obtain a hamon, but you should be very careful and precise in your quenching temperature or else you won't have a good hamon (because of the chromium in the alloy). On the other hand with a light alloyed steel (like XC70 or XC100 (I use C70e2u and C130e2u from Aciers du Tarn)) you can fairly easily obtain a hamon without huge accuracy in the temperatures. Easy tests will show you that you will obtain a Hamon anywhere from the maxi temperature to the minimum one. With little practice, you can obtain great visual effects in such steels. Therefore, although the quench line is representative of certain mechanical qualities, you can play with it and introduce variations for pure aesthetical purposes. First these ingredients are pulverized, sieved and mix together dry. I use a 1:1:1 mix in volume. Once the mix is homogeneous, I slowly add water to obtain the desired consistency. I use a fairly liquid clay that I apply to a 400 grit polished blade. I apply the clay with a wooden spatula, being careful to obtain the desired shape of the design on the blade. It is necessary to cover the back of the blade as well as surrounding the ricasso area to prevent quenching of the tang and the guard area. 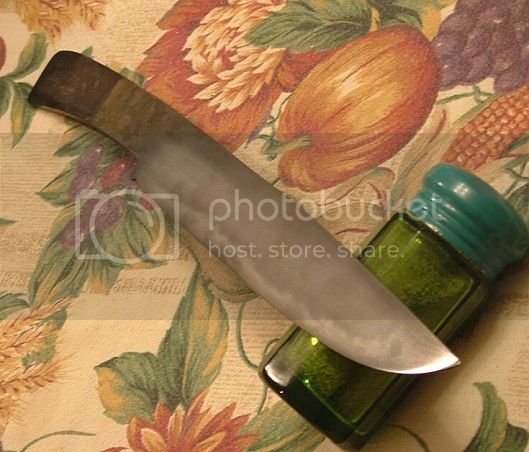 (that would render the knife fragile). I use a 5mm (about 3/16") coat of clay or less. I set the blade to dry in front of the forge but not too fast and not too abruptly. Once it is dried on both sides I make sure that all the water has been taken out for if there is any remaining it will crack the coat of clay, which would be detrimental. Make surer that there is no more water vapor escaping. Once thoroughly dried, it is ready for the hardening process. It takes some time to heat up the piece as it is now encased into a refractory blanket. It is therefore better to use a slower fire heat up slowly, rather than a rapid strong fire. You have to be careful to not go over the quenching temperature, for the blade has been normalized. Going over such temperature would increase grain size which would reduce the mechanical characteristics of the piece. Move your piece in the fire with precautions so as not to brake the clay coating. Once at temperature quench it into the proper medium (oil or water) making sure that only the part that you want hardened is in the medium (e.g. not the tang). Hardening the tang is not a good idea. Once your blade is cooled, remove the clay and proceed to further steps. Any comments or questions, feel free to contact me. Same if you want to illustrate with pictures. Thank you & thanks to Michael for the translate's help ! 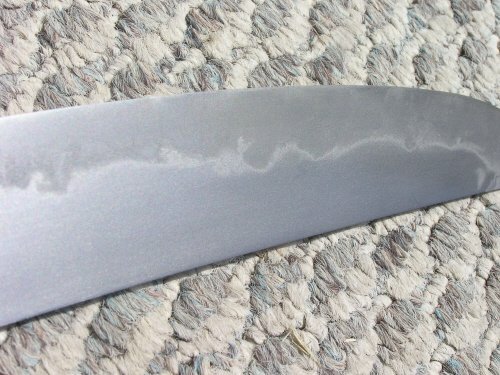 How about a link to some really great pictures of polishing (not by me) done on some blades I made. I wish I could polish like Keith, but I cannot. Interests:Bladesmithing, girls, oldtimer motorcycles, swords, etc. Also interested in collecting German Militaria from WW2, old authentic weapons, old furniture, antiques. This includes old Russian, Hungarian, Bulgarian and other European swords and bayonets as well as Ottoman yataghans, Balkan edged weapons, Celtic and Thracian battle axes, arrow tips, maces and etc. This is a rough polished Tanto I made several months ago. 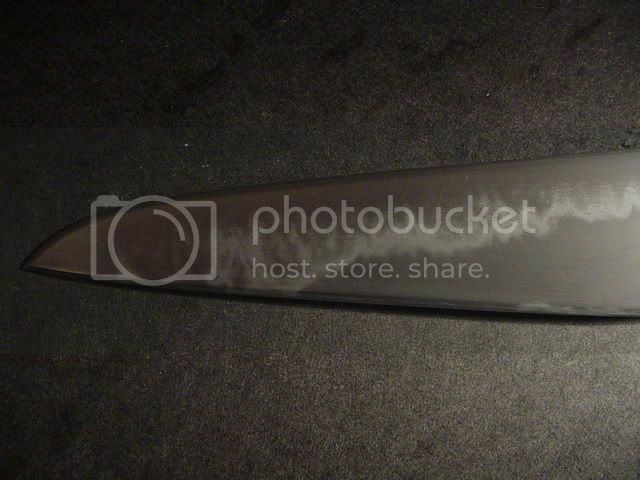 The photograph is really poor and I apologize to all of you guys with the cool blades and photos above. 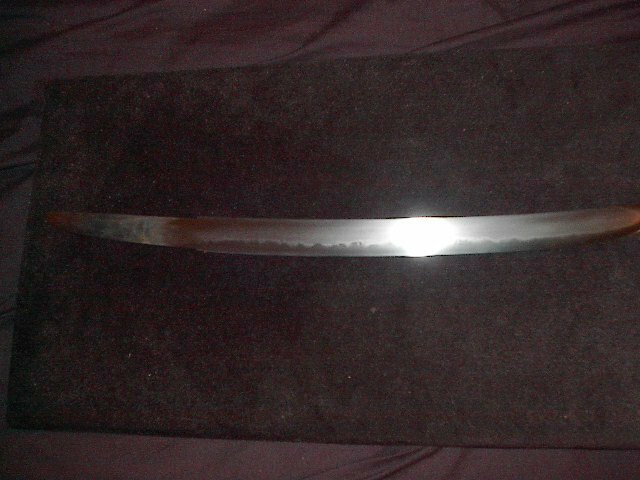 The guy who bought this blade applied a killer polish to it and the Hamon turned out to be extremely active and it had strongly pronounced Utsuri too (slightly visible on my crappy photo). Hopefully, by the end of November I will have another Tanto finished and will post high quality photos, taken with my new camera. For the blade I posted on, here's some details. 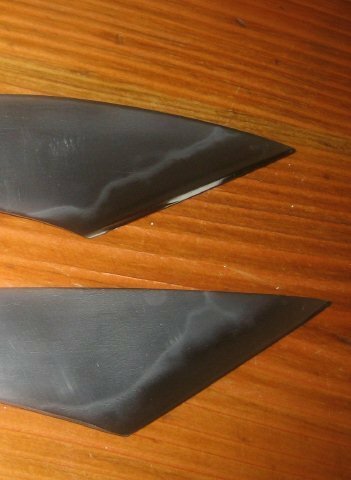 Blade is 1050, clay coated with satanite and quenched in water. 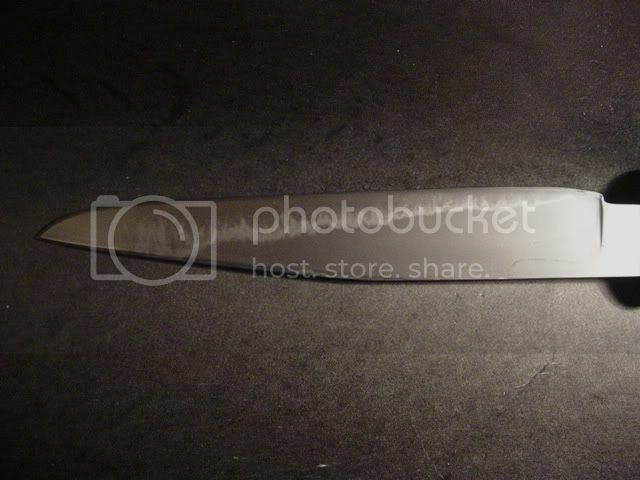 I like to coat the entire blade with a thin layer to protect from the forges direct flame. 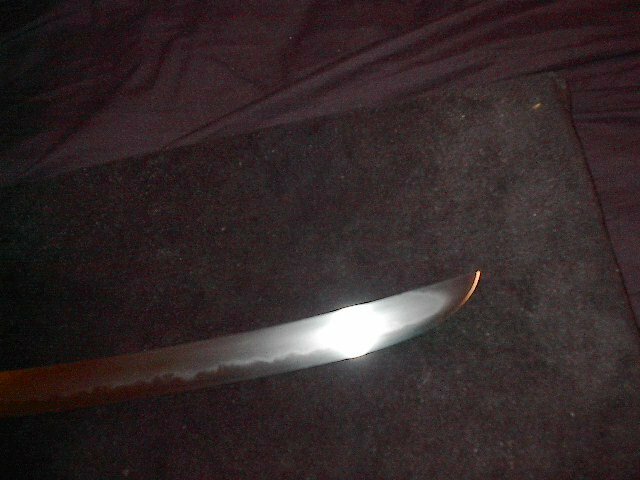 On this blade I just layed ashi at a slight angle and fairly close together, around 1/4" to 3/8" apart. 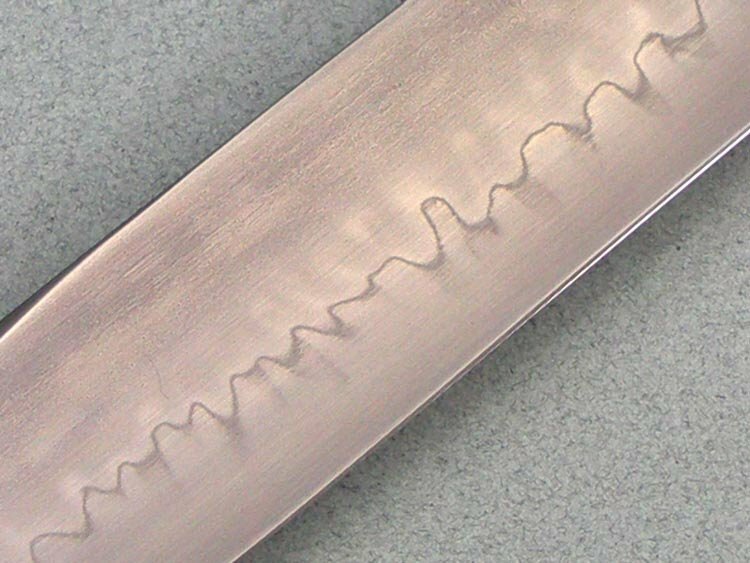 For the spine clay, I purposely only coated down to the shinogi, allowing the shallow hardening steel and the thicker cross section to decide how far up the hamon would end. I'll normalize the entire blade twice, then slow heat to around 1500 and quench horizontally. Three second count in the water and blade out for another three second count, then back in the water. If you look at the closer pictures (click on em, they get bigger) you can really see where the ashi lines were. The white hamon sort of follows around the clay lines, and flairs off the paired ends making a little "V". Weird how they kind of paired up like that all the way down the blade. Not what I was going for, but a happy accident. Hard part is gettting what I'm going for and less accidents. Well... here is mine too. Well seeing as it's my first hamon I should pop this in here. I haven't had a chance to polish this one out yet. Interests:Blacksmithing, knife and swordmaking, ancient edged weapon collection, Italian songwriters like Francesco Guccini and Fabrizio De Andrè. Motorbikes, cars and travels.